The auto resale business is big business, and auto leather repair is a strategy often employed by the used car industry to add curb appeal back into neglected and abused cars. While repairing car leather certainly has its place among the auto world, it remains a topic that is filled with much bad and misleading information. Having been in the world of professional auto detailing I have come across many repair jobs by unsuspecting people who have decided to purchase a used car unknowingly with repaired or re-dyed car leather. Above is an example of what would be considered a common auto leather repair job. Just like cloth, leather within your car is subject to tears, punctures, and general wear and tear of repeated use. 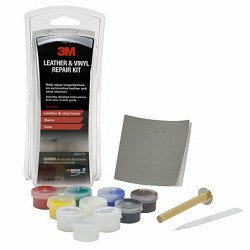 While I am not going to try and explain every possible leather repair kit or process out there, I am going to explain the general process I think you will find very revealing. Car Leather Repair Q. and A.
Q - Is auto leather repair different than leather dyeing? A- Auto Leather dyeing is the final process of leather repairs. Similar to paint and body, first the repair is performed, then the repaired area is repainted; or re-dyed as is called in the industry. Q - How is the repair process performed? A- Similar once again to paint and body, leather repair is performed by prepping, sanding, filling, and repainting. Q - How is the re-dyeing process performed? A- Another misnomer of auto leather repair, is in the name itself of leather dyeing. The more correct term would be repainting, as the leather is actually sprayed with either aerosol cans of pre-mixed color, or air brushed. Q - Is the repair or re-dyeing process permanent? A- This depends on your interpretation of permanent. The finished process does not hold up to cleaning and wear and tear like the original does. Q - If the process is not permanent, then why would you want to do it? A- Generally it is used to make a sale. As in making a used car look as good as possible in order to get the car sold. Or there are areas within your car that you know do not get mush use and abuse and any repair will likely hold up for a greater length of time. And then there is of course the fact that you cannot tolerate the unsightly appearance of damaged leather and anything would be better than living with the damaged leather/vinyl. Q - Can you tell if a car has been repaired or re-dyed? A- Anyone with a trained eye will know what to look for with a leather repair job. If the repair and dye job has been performed correctly, then testing of the areas in question might be needed to verify. As a professional if I am cleaning car leather, the area having the repair will usually peel, flake, or discolor due to the inability of the repair to hold up to traditional cleaning. Q - What specific things could I look for to determine if auto leather repair or re-dye has been done? A- I would start by asking; maybe you will get an honest answer. Past that, your first place to look would be in heavy use areas of the car, e.g. drivers seat entry point, door arm rest, center arm rest, etc. Look for uneven coloring or texture unevenness. If the area looks suspicious, test by touching and pushing. If there has been a major repair, the area will respond differently to pressure than the original material. The last resort will be to use rubbing alcohol and check for color fastness. Q - Is auto leather repair and re-dyeing something that can be done myself? 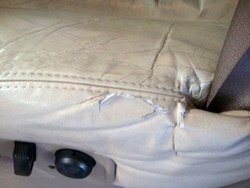 A- Yes, which leads us into the next topic of discussion for this auto leather repair page. 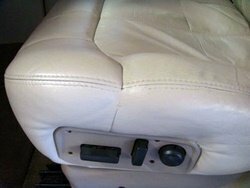 While this seems like an obvious, when you consider the time and expense to either perform the repair yourself, or hire a professional auto leather repair specialist, sometimes doing nothing becomes suddenly appealing. For smaller rips, tears, and abrasions, the following kit will offer an inexpensive alternative to hiring a professional who will typically charge somewhere north of $150.00 to come out and do a professional car leather repair job; of course this professional leather repair service will be far superior to your Do-it-yourself leather repair job. Perfect for do-it-yourselfer looking to add some curb appeal to make the sale. Contains everything needed for those vinyl or leather repairs..
First do a proper car leather cleaning of your cars interior prior to any auto leather repair; it will reveal more of the good and bad so you can make a more informed decision. Use the repair kit above as an economical alternative for repairing the leather or vinyl in your cars interior. Perfect for adding additional curb appeal to your cars interior prior to selling your car. As a professional, I am often in the position to be the voice of reason to many of my customers and people who reach out in search of help. For some of us it is hard to maintain a realistic sense of perspective to a world full of what may appear as random and chaotic. For this reason I say learn to clean and detail your cars interior first, then assess as to the actual damage you feel is in need of repair. You may find you are so impressed with your newly found detailing prowess that those areas of damage become insignificant.